High Quality Stainless Steel Construction - Dishwasher Safe! FDA Approved Silicone Gasket Material to prevent leaks or spills, does not come with jar ring to hold it onto the jar. 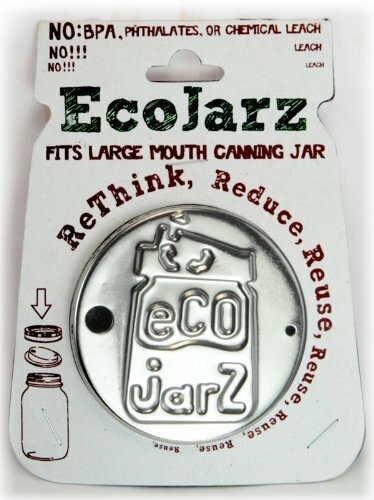 The EcoJarz drink-top will fit any standard mouth canning jar - whether it's an empty apple sauce, jam, or spaghetti sauce jar - and turn it into a glass to-go drink container! Our drink tops are made of high-quality stainless-steel with an FDA silicone gasket to prevent spills and leaks. They are Dishwasher Safe. EcoJarz gives you the healthful benefits of glass and stainless-steel and the ability to use and reuse hundreds of glass containers commonly available. Start up-cycling your jars and drinking toxin-free today! EcoJarz Drink-top only, No glass or jars or Jar bands included.